The day started off, well, but I knew Becky, Lini, and I would need to be flexible. Months ago in my planning, I had chosen Annapolis as my termination point. We were all anxiously awaiting the final ride. Back then, I thought I had seen a small beach near the Naval Academy. Later, I had moved the target a little further east to the Sandy Point State Park, where it looked like I could have access to the shore. 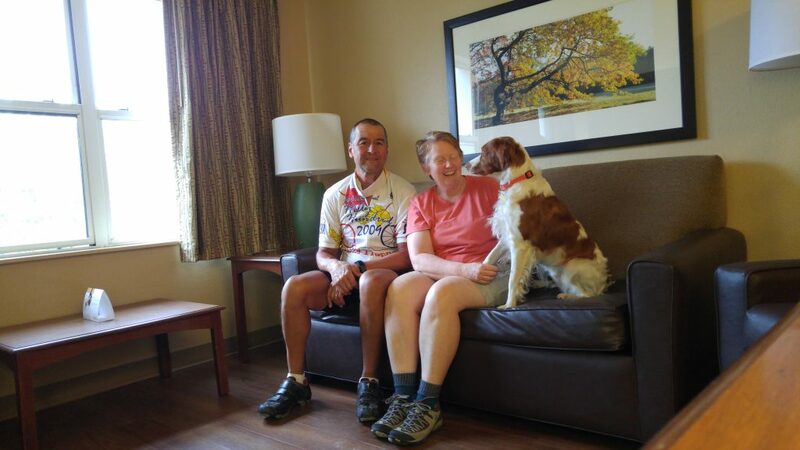 Now that Becky had Lini, one of our two Brittanies, with us, she suggested Downs Park. It was on the shore between Annapolis and Baltimore. Downs Park was a little further north than my original target, but the beach was dog friendly and would make it easier for Becky to hang out until I arrived. It would also make the final day a little shorter, at about 55 miles. Once again there was a strong possibility of rain. It had rained overnight and the ground was very wet when I had to take Lini outside for her business at 4:30 AM. By mid afternoon, some big storms were expected. I wanted to dip Hidalgo’s wheel in the water, but not get deluged from above. Becky had picked me up the previous evening in Damascus, MD, but there were no hotels in that town, so we had spent the night in Gaithersburg. Becky was going to drive me back to the point I had already ridden and I would continue the drive to the sea from there. With all the final packing and the short 12 mile drive, I wasn’t riding until 8:35 AM. It was not only a ride to the sea, it was once again a race against the rain. After a fair amount of traffic leading north to MD 144, the turn east gave me a wider shoulder and I started making good time. Since I was headed to the sea, I was naturally going mostly downhill. There were still hills to climb. But as they say (sort of) in the “Princess Bride”, mostly downhill is not completely downhill. I still had some climbing to do to earn my way to the sea. it was on one such climb that the proverbial wheels came off. More specifically, I discovered the weak link in my plan as my chain snapped while climbing a hill. The dérailleur had been having trouble shifting since the mud bath 2 days ago. Now, climbing this hill, the gear not only skipped, it felt like the chain had come off. 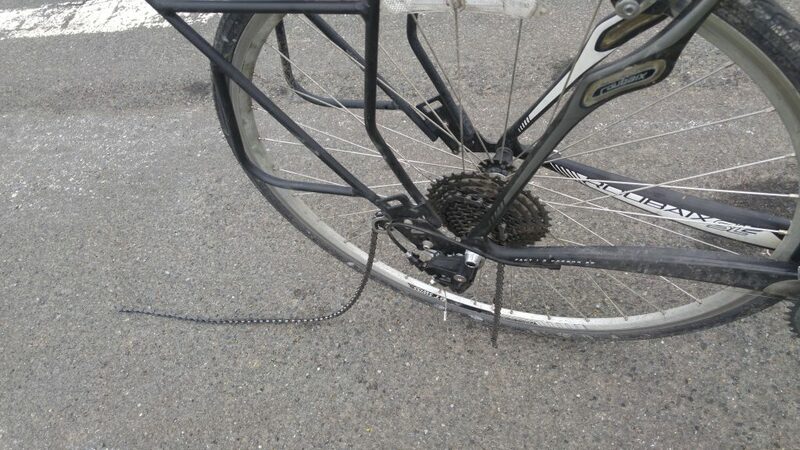 When I looked down, I saw that the chain was not only disconnected from the drive train, it was dragging on the ground behind me. I was an hour and 15 miles into a 55 mile ride. I pulled Hidalgo off the road, over to the long entrance to a farm whose front yard was a wheat field. I called Becky to come get me. She had taken Lini for her morning walk and was 20 miles away. Waiting for her arrival, I searched for bike shops. The nearest one was only 6 miles down the road, but didn’t open until 11 AM. My chain link tool that I had packed for such an occasion was still in my panniers – with Becky. There was nothing I could do but wait and hope it didn’t rain. When Becky arrived, I attempted to remove a rivet from the chain with the tool. it had been almost 30 years since I had last used the chain tool. In that time, my knowledge of its use had not improved and chains had become lighter and the spaces between links had gotten smaller. This was no longer the right tool for the job and it was time for some professional help. It was now past 10:30 AM. We loaded up Hidalgo and headed for the bike shop. While waiting for it to open, we got some breakfast sandwiches, since it had been another disappointing continental breakfast in the hotel. While we were waiting for the shop to open, Becky checked the forecast. The rain was becoming a more likely possibility now that I would lose a couple of hours to the breakdown. We did a quick check of the map and decided that I should head straight across to Baltimore. Middle Branch Park seemed to have some shore that I would now target. The folks at Race Pace Bicycles were knowledgeable and had a good stock of parts. They had a new chain on in minutes, but also made a few adjustments to my shifting system. They told me that things sometimes get out of line when a chain snaps. I mentioned my ride through the mud and my long journey. They did a test ride, but told me Hidalgo would need a lot of work after the ride was done. They got no argument from me. I was on the road again. I passed through some nice areas. Ellicott City was especially charming. I was tempted to stop at the local brewery, but I was still racing the rain. I had a massive hill climb leaving town as it was along a small river valley. I moved on to Catonsville and was making good time. It also seemed like a friendly place. I asked a couple of young ladies to do a city limits picture for me. I downed a few mouthfuls of trail mix and water and I was off again. 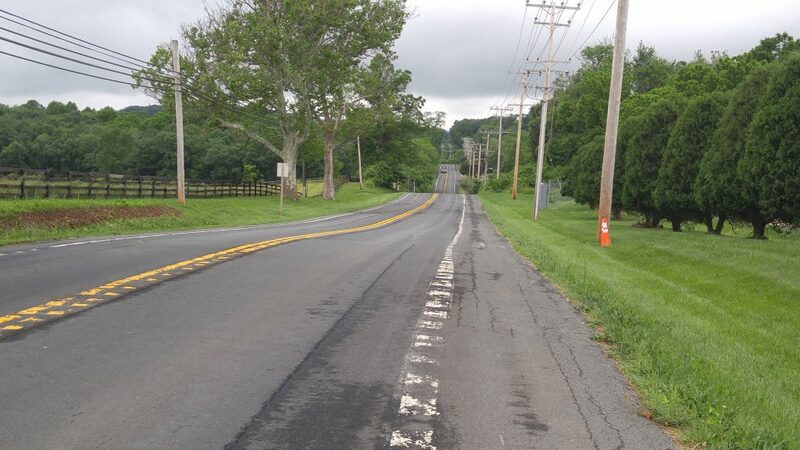 I had been on MD 144 or Frederick Road almost all the way and knew I would have a turn in Baltimore along US 1. That wasn’t the only thing that was turning. 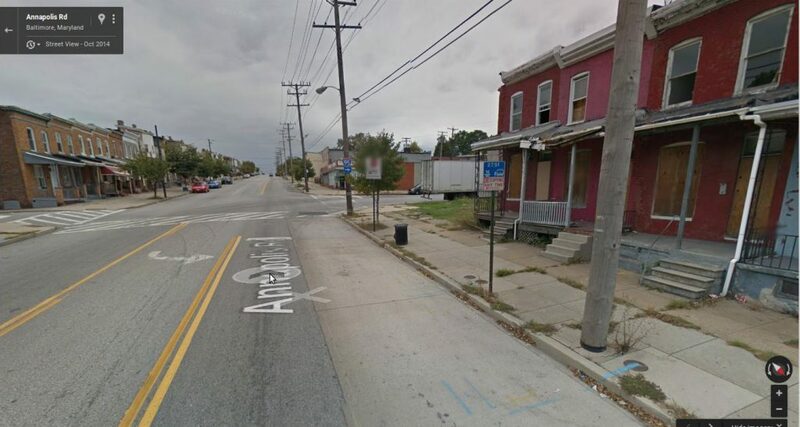 I was peddling for all I was worth and as soon as I crossed a bridge at Gwynns Falls, my bike lane disappeared and the neighborhood had dropped significantly on the socio-economic ladder. When riding, I try to make myself conspicuous, especially, when the sky is overcast. I have a bright jersey and have multiple flashing lights on both front and rear. This was an area where I wish I wasn’t so conspicuous. I was getting a lot of green lights and I was in the city. I knew I had a turn coming, but I just wanted to keep moving. Of course US 1 was not labelled that way in the city, it was Monroe Street. I, of course missed the turn. A Google Street view. The streets were more crowded on the Sunday afternoon I was riding through. When I finally got to a spot where I felt comfortable to stop long enough to check my position and route, I found that I needed to double back around a few one way streets to get back on track. I grew up in a heavily industrialized suburb of Chicago. I have travelled and gone running in the downtown areas of Chicago, New York, and cities all over the world and never was worried. I was a little worried. I finally found Annapolis Road, which would lead me to Waterview Avenue and the Park. Climbing yet another hill, I made my way around an MTA bus. Some young men were conducting some business in what looked like a not so abandoned house. I finally was on Waterview searching for the place where Becky said she and Lini were waiting. I checked the Life 360 App and found their location. I got to the end of Waterview and rode into a parking lot. I could see Becky’s Subaru with the bike rack. Finally, I called her and found we were on opposite sides of an old police bus. Hidalgo gets his final baptism in Chesapeake Bay at a boat launch. Rather than a 55 mile journey to Annapolis, my ride came to an end with a 37 mile adventure to a boat launch near the edge of Baltimore. I must admit it felt somewhat anti-climactic. Regardless, it was hard to believe it was over. 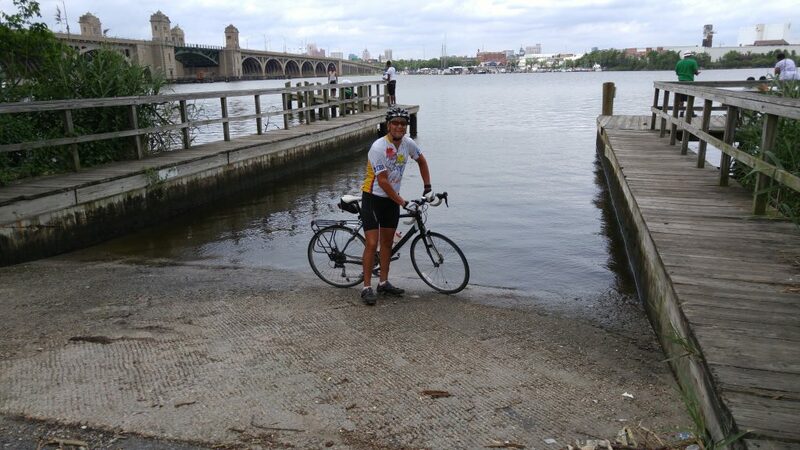 Approximately 2,950 miles from the launch in Oceanside, California, I had ridden across the country to the Atlantic (Chesapeake Bay). When we got Hidalgo loaded and were driving out of Baltimore, we hit an enormous downpour. We beat the rain by about an hour. It was an adventure I will never forget, but I’m glad I wrote some of it down every day!